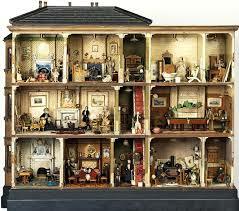 Once there was a dolls house and in it lived twenty one dolls. It was a bit crowded. During the day the twenty one dolls just sat or stood, staring fixedly into space. They didn’t think about much, in fact their minds were a blank canvas. The house they lived in had ten rooms, some large, some small, with a grand staircase right in the middle and the house stood in a toy museum although the dolls did not know that. The sitting room in the house was full of stiffly upholstered little sofas and chairs. Pictures of haughty looking ancestors hung on the walls. On a cluttered mantlepiece ornaments leaned against vases and vases leaned against candlesticks. From the ceiling dangled a little chandelier, and on the floor gleamed a rich red rug. On high backed chairs round a table sat dolls wearing dresses with frills. Two were holding baby dolls at arms length.The babies in their teeny weeny bonnets looked sternly up at the ceiling. Against the wall, and beneath a family portrait, sat a little girl doll reading a book, her small wooden legs sticking straight out revealing her black painted on shoes. In various attitudes about the sitting room other dolls stood or leaned or watched. There were, as I have mentioned, quite a crowd of them. Meanwhile in the billiard room across the landing, dolls sporting high-waisted felt trousers and bright jackets gripped wooden cues and leaned against the green baise table idly poking at the billiard balls. Others stood watching, holding tiny glasses of whiskey. Some of them had little painted moustaches. There were other dolls in the house. There were dolls on the stairs going up or going down, there were dolls in the study and the schoolroom and dolls in the bedroom and the kitchen. In fact the only room without a doll was the store room where they kept the brooms and buckets. They all looked bored stiff. All of them.They had to, because they were being watched. Every now and then huge faces would press against the windows of the house, peering in. It felt very intrusive. Large eyes rolling to right and left, observing, scrutinizing, taking note, hoping to catch the flutter of an eyelash or the whisper of a sigh. The dolls could hear the huge noses sniffing and breathing. Sometimes the minute sheets of paper on the writing desk in the study lifted slightly in the unwelcome breeze. Sometimes the huge staring eyes seemed to be covered with glass that glinted and sparked in the lights which would suddenly snap on for no reason. It was all the dolls could do not to blink. This is how it was during the day and every day but doll days are not like ours, they are shorter for a start and begin at what you might call closing time or even bed time. So at around six thirty, when all was quiet outside, the twenty one dolls started to feel a trifle peckish and to look a bit lively. They started to think about breakfast! Jostling and pushing they all trooped downstairs to the kitchen, elbows sticking out and pointed little noses, well, pointing, and they gathered round the large kitchen table to eye up the painted plaster food which was stuck to the plates. This is where they were, one evening last March, when they began to hatch a plan. A plan to sort out those nosey eyes! Delighted to see a new story!